A drive along Oahu’s eastern shore is a day filled with adventure and unforgettable views. It’s the perfect way to gather friends and family together a journey away from the hustle and bustle of Waikiki. The drive is uncomplicated, relatively short and very rewarding. Navigating the roads on Oahu are worry-free and predictable. Follow the flow, enjoy the views and keep in mind that it’s an island, so getting thrown off-track a few times is certainly forgivable and easily correctable. For those who prefer to have the facts at their fingertips, it’ is highly recommended to download an iPhone travel app or an Android travel app to eliminate all the guess work. A visit to the Kaiwi Coastline must include a visit to Hanauma Bay for a quick photo or as the highlight of the day. Plan on an early morning or late afternoon of snorkeling to make the day perfect. There are several sights to see along the way. Many places to stop for that perfect photo and views of the neighbor islands, too. Here are some of the more important stops along the coastline to enjoy. 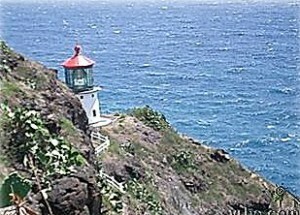 Located midway between the summit of Diamond Head and the beach below, this pull out allows for a panoramic view of the ocean and one of the largest lighthouses in Hawaii. There is also an interesting rock monument commemorating Amelia Earhart’s flight to Oakland in 1935. This nature preserve offers some of the best snorkeling in the islands. The collapsed crater provides a gathering spot for fish. Not far from the Molokai Lookout is another pullout call the Lanai lookout. This area is also popular to view pod of humpback whales. On clear days views of the island of Lanai can be seen. One of the more popular spots to stop along the Kaiwi Coastline. On days when the ocean is expeciallty rough, ocean currents force water up qand through an openining in the lava shelf that creates a geyser that blows several feet into the air. This popular beach is a gathering spot for experienced body surfers. The beach is a gathering spot for area locals especially on weekends. The paved parking lot serves as the trailhead for one of the easier hikes on the island. The trail ends at the Makapuu lighthouse views of the windward coast and Makaluu beach below. The Kaiwi Coastline becomes the Windward coast at the Makapuu Lookout. Here one can continue through to the windward side of the island or backtrack toward Waikiki.